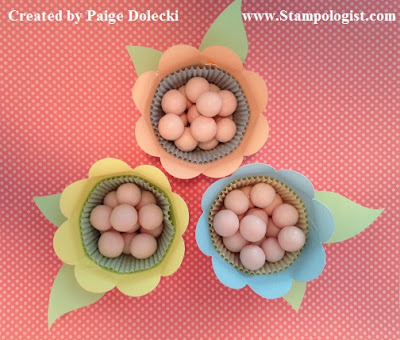 A couple of weeks ago I was at Michael's and saw some adorable flower shaped cupcake liners - loved them but the price was high and if you are like me, whenever I see something cute I always think "hey, I can make that!" When I started putting together my Easter project week I knew I wanted something like that but hand made and inexpensive. Boy was I happy when I found this little cutie on p.73 of the Artiste manual! Here is the flower in profile. I bent the petals out a bit by rolling them on a round barrel pen and added a set of leaves (p.32 Artiste Manual). Each sheet of cardstock will cut 3 of the flower cupcake liners and the leaf sheet holds 9 sets of leaves. I've put an empty cupcake liner inside and filled it with candy - you can pick it up and the liner won't fall out the bottom hole. If you need to purchase the CTMH Artiste Cartridge, please visit my site at www.Paige.CTMH.com! I'm on a tight budget this year so creating something fun/cute/functional out of materials that we already have at the house is an area that I get really excited about. I love that I was able to use up a bunch of retired papers for my Easter goodies this year, have a bunch of cute things to surprise my kids with and had fun spending time in my craft room! 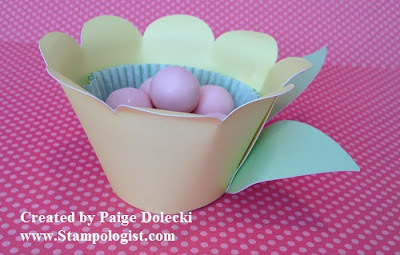 Are you having fun crafting for Easter? What kinds of projects are you making? These are so cute, Paige! I really need to start using those cartridges more! They really are loaded with all kinds of cool things. Thanks for sharing these! Very clever. I'm now looking at the cupcake liner that looks like grass and wondering if I can make it look like a sunflower by curling the edges as you've done here. Thanks so much for the inspiration! !